Happy New Year! Are you someone that does resolutions? Goals? Perhaps you have a word for the year? I’m writing a little before Christmas because I’ll be traveling and I haven’t quite figured how I should tackle the new year. I can say that wellness has to be on my list. This is the first year I made Christmas cookies and did not give any away (the family had an intervention,) and it was also the first year my husband made his father’s Italian cookie recipes. I ate way too well. I remember when I had a gym membership the place was insane the first week of January (one reason I no longer hold a membership, this introvert felt it was too people-y!) However, by the end of the month, the place was back to the familiar faces who had been there year ’round. Resolutions are hard to keep, and that visual sticks in my mind. If exercise and eating less are part of your 2019 plan, I’m probably not a lot of help today, but I guess I’m in a reminiscing mood. When I released the Surrendering Time Series, I facilitated a book club for each book where I gave exclusive content to participants. They learned everything I knew about the real village of Speculator, NY, as well as secrets behind each chapter. We had great fun talking about characters, plot choices, and other directions I considered for the books. I tried to do something special with the end of each book club. With Entrusted, someone had the idea that we have a party where we serve all the food that was mentioned in the book. If you’ve read Entrusted, Jenna Anderson is the director of the Speculator Falls Senior Center. They have a daily lunch delivered each day, plus, Jenna and Ben have plenty of meetings at local restaurants. Don’t forget the community-wide picnic for July 4th. We went through the book and listed all the foods. There was plenty to choose from. My mom always said the way to a man’s heart is through his stomach, and I think we proved the same for readers. Our book club had salads, fruit cups, banana bread, moon cookies, ziti, ice cream, and coffee. That’s off the top of my head. I picked a name from random and the winner received pancake mix and pure Adirondack maple syrup from McComb’s Oak Hill Farm. The McComb family are the ones who introduced me to the Adirondacks way back in 1993. That first visit got me thinking about the characters who eventually started what became Entrusted. I also had a PowerPoint giving them a tour. My book club was in a Youngstown suburb. For many, they had never seen so many trees or even a village without a traffic light. When they heard the census defines the area as pioneer country, that was just shocking! The readers also loved seeing the real grocery store and King of the Frosties, a place I re-named Jack Frosty’s. 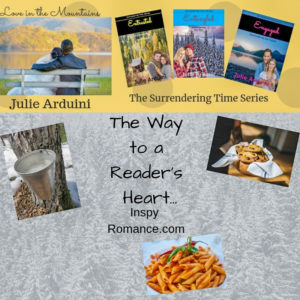 Food really connected us that day, and so did the love of reading a clean romance with a message of Christian faith. The entire series is now available in addition to Amazon. If you know someone who has a Nook or Apple Books, Kobo, or would like to request through their local library eBook lending program, let them know about Entrusted, Entangled, and Engaged. They are also still on Amazon in print and eBook formats. How about you? Have you ever attended a book club like this? Do you think a way to a man’s heart is through his stomach? I hope you have s blessed and abundant 2019! Hi Julie, your book club sounds marvellous, what a fun idea to celebrate by serving food from the book! I have never had the privilege of being part of a book club but I think it would be fun. Happy New Year, Wemble! We really had fun and ate well during that book club! Hi, Julie! That club sounds terrific…. I have been lucky to have been in book clubs but that was years ago, now I love our Facebook book clubs! I am so blessed to be a part of Valerie Comer’s and Alexa Verde’s, Autumn Macarthur’s and Marion Ueckermann’s FB book clubs! It is wonderful to share a love of the same books with people from all over the world!! I agree! Facebook has had a lot of hiccups lately, but I love how it can connect us in positive ways. There’s not much else out there more positive than books! Hi Julie! Happy New Year! As a retiree, this year I am drawing a blank. No resolutions, no goals, and no word for the year. Since the passing of our fur baby Penny in August, we are truly empty nesters and so I am looking forward to being able to travel more this summer. Your book club reminds me of our area Book Club for Foodies, which unfortunately folded January 2018. For three years the area library and School of Cooking collaborated and explored food themed books. A group of twenty women met monthly discussing the library chosen books (fiction, non-fiction, mysteries, biographies and more) and for a fee of $20 the local School of Cooking prepared a three / four course meal based on the book. This club was the highlight of our month. Unfortunately due to a change of management at both at the library and School of Cooking, this unique and delightful book club was dispersed. With a father, brother, husband, three sons and two grandsons – I know that the way to man’s heart is through his stomach. I often tease my sons and grandsons that the only way they come to visit is when I promise to feed them. Best wishes. Enjoy your weekend. Happy New Year, Renate! I pray 2018 holds a lot of blessings for you. That collaboration sounds like it was a great experience, I agree, a way to a man’s heart is his stomach. Food is the one language we can all speak together! I’ve only been to a couple book club meetings. They both served food, but one was an amazing lunch/tea. I will never forget that experience as long as I live. Those ladies were amazing! Kimberly, I think an organized, well-fed meeting makes such a difference. I’m not fancy by a long shot, but once we went through the book and picked a menu, it was easy to put together. It was a lot of fun. I hope you have many blessings throughout 2019! I’ve never been part of a book club but your’s sounds like it would be a lot of fun. Having a party with foods from the book was a really neat idea. Happy New Year! We really had fun reading and eating. I hope you experience a book club like this some day.